After receiving several offers from the company, Janardhana decided to take a position at a smaller research company based in Maryland called Novatech Process Solutions. “They did a lot of automation work so it was more of a systems engineering type role. But I did that for about 5 years. It was a great opportunity at that time,” says Janardhana. At the end of 2012, Janardhana returned to the company that had felt like home since she was an undergraduate, Johnson & Johnson. “It all came full circle. It started there and I came back there,” she says. 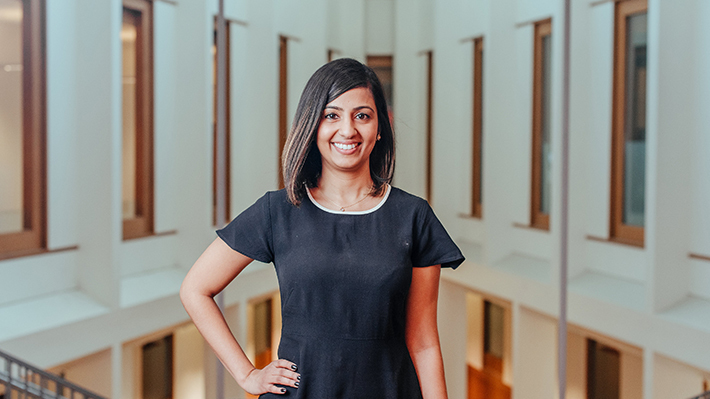 She began the MBA program in 2016 – four years into her return to Johnson & Johnson – choosing the school she credits for jumpstarting her career. “With Drexel, I knew what I was getting into. I was always proud to say I went to Drexel, so I knew I’d love their graduate program,” she says. Her move back to school wasn’t something she took lightly either, when she chose to return to the university, Janardhana wanted to make sure she could bring what she learned back to work. Once she began her new position at Johnson & Johnson as an associate director in the critical phase program management department she says it all came together. “I definitely think it helps that I am pursuing my MBA at Drexel in my new position. It also helps that my supervisor is a Drexel grad,” she says, with a laugh.